As busy as we all are with work, family, social and personal obligations, there’s often no choice but to skip deliberate physical activity when our schedules get overcrowded. At least, that’s true for me. Whether walking, hiking or going to the gym, I really enjoy getting to spend some time exercising. Recently, though, that time was consumed by the need to support my husband, Bill, as he underwent knee replacement surgery. We both knew it was a big deal, but I had no idea how much of my days were going to be filled at the hospital, the inpatient rehab facility, traveling to physical therapy and tending to our household completely solo. For three full weeks, I lived in the world of caregiving. In that world, as anyone who’s spent time there knows, your otherwise normal routine disappears, household chores fall by the wayside, and you eat from a vending machine or a drive-thru. And for me, let’s just say poor food choices and getting no exercise were a bad combination for weight management, and leave it at that. 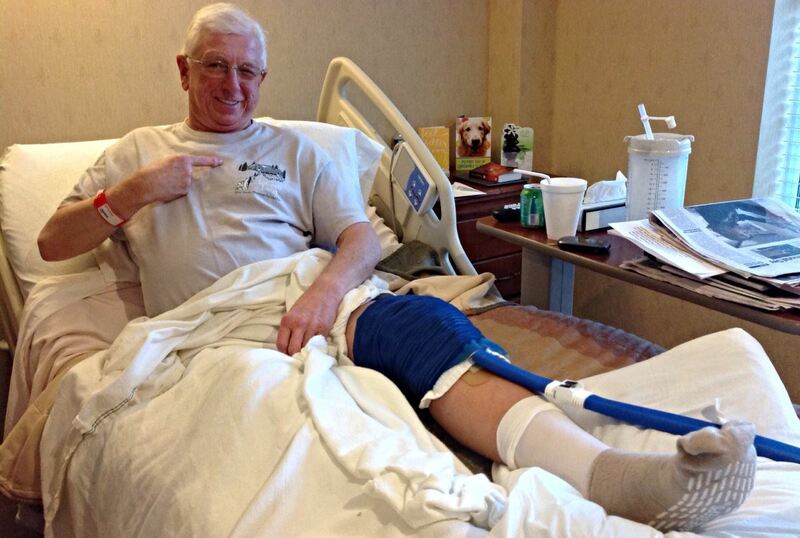 Bill’s knee replacement surgery was on May 5, 2015. He has had the best experience possible and is recovering quickly, for which I’m very thankful. I’m thankful, too, that I’ve been able to resume a near-normal routine, with some time for periodic exercise. I’m also looking forward to the time in the future when Bill can join me in some of our favorite active pursuits—a list topped by hiking. 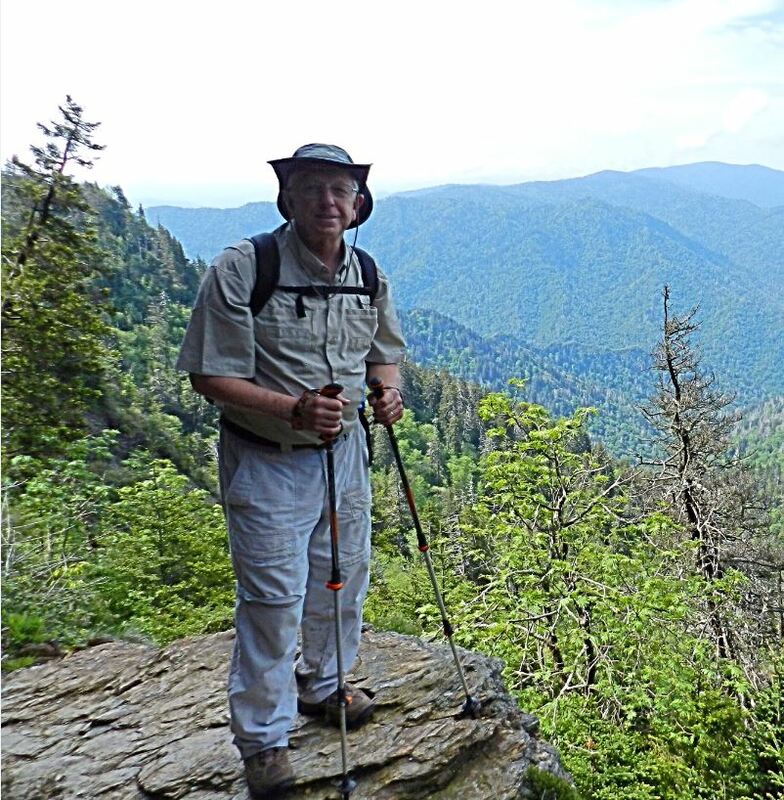 In fact, while still a rehab inpatient, Bill set a goal of hiking to the top of Mount LeConte next year, on the first anniversary of his new knee. At an elevation of 6,593 feet, Mount LeConte is the second-highest peak on the Tennessee side of Great Smoky Mountains National Park, with Clingman’s Dome the highest at 6,644 feet. LeConte is one of the park’s most beautiful, signature hiking destinations, accessible to the public only on foot via challenging trails. In my experience, Clingman’s Dome is more of a driving destination, where people park at the base of a paved, one-mile walkway and make that very steep trip on foot to the impressive observation tower. Hiking Mount LeConte can be one of those “been there, done that, got the T-shirt” activities, thanks to a small-scale store operating in a lodge atop the mountain. Each year, a new “LeConte Lodge” T-shirt design – complete with the current year’s imprint – is sold only on top of the mountain. Bragging rights and avid hikers are good for T-shirt sales. When my husband wore his 2014 shirt to post-op physical therapy, he was the talk of the group. His therapists were impressed that a knee replacement patient had ascended LeConte with what had to have been a very damaged and painful knee just 11 months earlier. That inspired Bill. 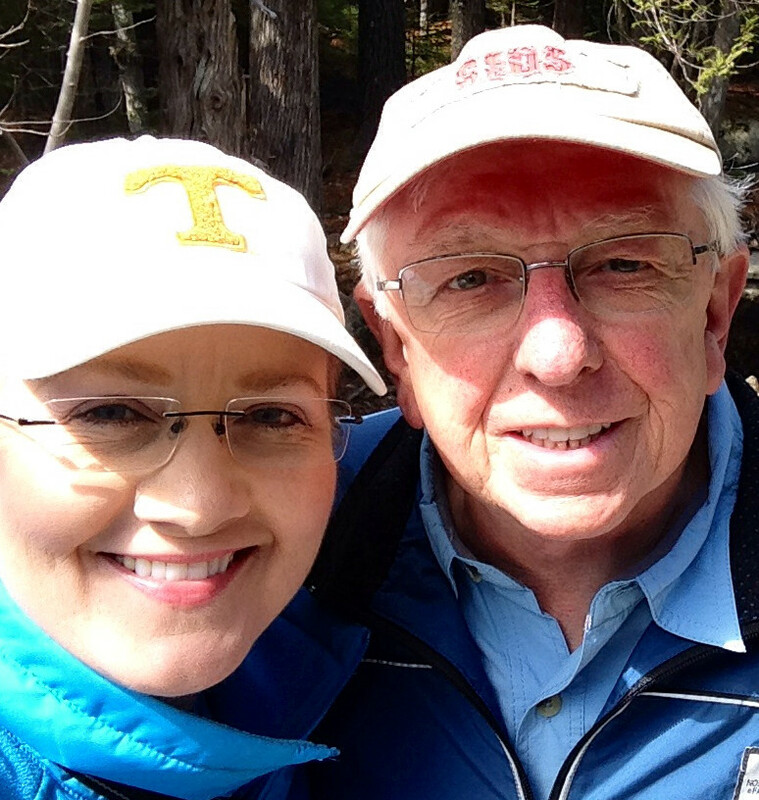 Having learned that total knee replacement requires 12 months for full, complete recovery, he decided he would celebrate the one-year mark by ascending LeConte again, via the 10 miles roundtrip Alum Cave Trail. I was pleased his experience was going so well that he was already looking forward to returning to hiking, and a big hiking challenge, at that. We have a long way to go, and he has a lot of physical therapy ahead to prep for us to take on that challenge, but I’m eager and confident it will happen. I’m also reminded of the importance— to exercising regularly—of setting goals. I don’t know anyone who decided to run a marathon and ran one the same day. I never have and am confident I never will run a marathon, but I have set activity-related goals, and every time I did, they were the catalyst to better fitness. Setting goals is motivating and helps you stay focused. Goals give you a reason to stick with and track your physical activity. Checking off a goal—whether it’s walking five miles a week or running five miles a day—brings a satisfying sense of accomplishment and can encourage you to set more challenging goals. Among family members, setting goals can encourage participation and friendly competition. Goals can start anywhere—wherever is most realistic—and without them, it can be hard to start at all. If you’re older and it’s been a while since you were active, you also might enjoy the wealth of great information in the National Institute on Aging’s “Exercise and Physical Activity” guide. It’s a comprehensive resource on various types and benefits of exercise – and identifying and setting goals. In my house, Mount LeConte is on the figurative horizon until May 2015, when I’m counting on seeing its actual horizon. Gina and her husband, Bill Phelps, are outdoor and hiking enthusiasts who especially enjoy venturing into new territory. They share a love of all things Vols, baseball and travel. Gina is assistant vice president and director of communications for the UT System Administration.